Flavorful and bright, "Living Impressions" make coffee-drinking easy, wherever you are or whatever you're doing. Wonderful with morning toast and jam, a business lunch or an afternoon snack, these coffee are welcome companions throughout the day. - It's the famous coffee cafe, Starbucks' signature blend. - It's a wonderful, round, balanced, straightforward cup of coffee. - The great thing about it's that all the flavors meld together so well. - It's a complex blend of East African and Latin American beans, which together produce a slightly "citrus" flavor and a lively, tart acidity. - While it's bright and welcoming served hot, this blend is wonderful poured over ice. - Single origin. - A long considered best coffee in Costa Rica. - From the best growing area in the country, Narino Supremo is the best Colombia coffee we've ever tasted. - Surprising and delicious, with a clean, brisk acidity. - It has a fresh, herbal flavor that's elusive, nearly indescribable. - Peaberries, named for their shape, occur when only one of the 2 halves of the bean develops within the coffee made exclusively from peaberries. Deep and complex, "Rich Traditions" are satisfying coffees to savor -- wonderful with desserts and rich enough to drink all by themselves. These coffee offer the ultimate smooth experience. - It takes the bright and brisk qualities of Latin American coffees and combines them with the heaviness of a select Indonesian coffee to create something that's a little bolder, but still mellow and well-rounded. - Blend. 80%Yukon Blend to 20% Italian Roast. - This is a classic dessert coffee. Try it with your favorite chocolate treat. - It's also versatile; it works great with any brew method. - Caramelly, smooth, great balance, slightly sweet finish. - Blend. - Makes a fantastic drip coffee that's incredible with dark chocolate. - Connoisseurs of dark roasts love its sturdy, assertive flavor and slight smokiness: it has the sweetness of Espresso Roast but not the intense "roastiness" of French Roast. - Single origin. - A favorite in the tasting room, this coffee comes from a renowned area in Guatemala. - It's well balanced, with soft acidity and incredible flavor combinations. - It seems simple at the beginning, but then come so many levels of discovery -- there's that little bit of dry cocoa taste in the background. - Antigua has a very luxurious texture: clean, sharp, interesting. - single origin. -it's a favorite, perfectly balanced, with wonderful, intense flavors. It's full-on taste experience without being heavy. - Bright, complex, fruity, hints of grapefruit. - Very good hot or iced. - single origin. 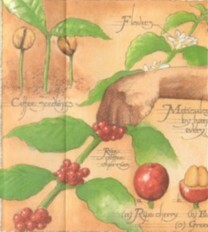 - One of the great coffee traditions, these are the beans that made "Java" synonymous with "coffee". - It has a mild yet slightly spicy flavor that's well-rounded. Distinctive and assertive, "Bold Expressions" coffees command attention and add a delightful spark to the flavor of any food. This is coffee on the edge: incredibly intense, intriguing and fun. - As the world's first blend, it has a noble legacy. 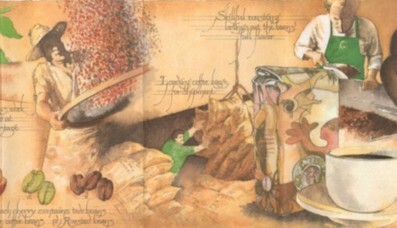 - The Dutch took an exotic, Arabian coffee and gave it move body by blending it with coffee from their plantations Java. - Gold Coast Blend is sophisticated, "big city"- an intense, courageous cup of coffee. - Full-bodied and complex, it's a showcase for many of our finest Latin American and Indonesian coffees, with a touch of Italian Roast to add sweetness and depth. - Blend. - This extremely dark-roasted blend is blunt, smoky and intense. In the end it's not so much the variety of coffee you taste, it's the roast. - This coffee is wild, wonderful and unpredictable, with hints of spice, rum, chocolate, tropical fruit or nutmeg. - It's a magical coffee with a fleeting, floral aroma and a bright yet soft finish. - What's most spectacular though is its exotic lemon-pepper taste. - Sulawesi is the most elegant and refined of our Indonesian offerings, considered by many to be approachably exotic. It's smooth, full-bodied and earthy, with a background flavor of fresh green herbs. Going without caffeine doesn't mean going without taste. Just need to find out a way to decaffeinated without losing coffee flavor. As the name implies, "Decaffeinated Classics" have everything the finest varietals and blend do, with one exception. - A delicious, straghtforward cup of coffee and a Latin American blend that's a coffee classic. - Light-bodied and lively, it offers a satisfying blend of well-balanced flavors. - A bold and intense decaf, with deep, full-body and an earthy aroma. - It's smooth and comforting. - Smooth and satisfying, it's concentrated intensity is balanced with a creamy texture and some background sweetness and just a hint of acidity. Also makes a delicious brewed coffee. - Complex and balanced, combining smooth and earthy Indonesian coffees with exotic Ethiopian beans. - An elegant decaf that balances rich, lively flavor with soft acidity. - In its raw state, the bean's flavor potential is locked deep within. Light tan - Cinnamon roast or sometimes called an institutional roast, this is the colour of supermarket coffee. Light brown - City roast, with more flavor than a Cinnamon roast. - Beans have reached a uniform, light brown. Bittersweet-chocolate brown - Espresso roast, the colour changes from chestnut to bittersweet-chocolate brown. 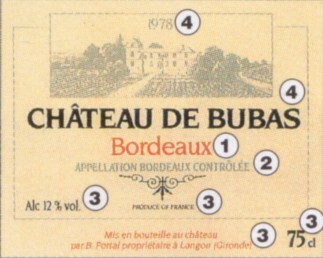 The description on a wine label is a legal requirement and must be true and accurate complying with strict French government regulations. 2 The wording 'Appellation d'Origine Controlee' or 'Appellation Controlee' for controlled area wine with the name of the appellation (the place). 3 The wording 'France' or 'Product of France' Name, company name and principal address of the bottle or producer. The nominal volume of the bottle in liters (l), or centilitres (cl), or meillilitres (ml). The alcohol level expressed in % of volume (%vol) preceded by 'Alc'. 4 Region of production and vintage. Grapes are essential to wine -- the principal influence on style, character and flavor. Red wines are produced from red grapes while white wines can be produced from both white and red grapes. Only around 100 of the 7000 grape varieties of France are widely used. The 16 most commonly utilized varieties are the following 8 whites and 8 reds. Cabernet Sauvignon - Deep colour. Flavours of blackcurrant cedar, mint dark chocolate, tobaceco. 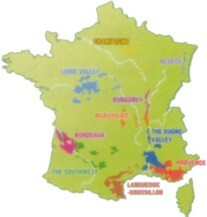 Bordeaux, Southwest, Loire, Provence, Lanquedoc. Carignan - Intensely-coloured and highly tannic (stong tea), used for blending in reds. Rhone Valley, Provence, Languedoc. Gamey - Light, fresh, notes of strawberry and cherry Beaujolais, Maconnals. Pinot Noir -Characters of red berries, violet and rose, silky textures and gemey complexities. Brugundy, Alsace, Jura, Bugey. Syrah - Powerful. Flours of raspberry, black berry, spices, leather, game. Rhone Vallry, Provence, Lanquedoc Roussillon. Chardonnay Full, supple, buttery. Flavours of apple, pearm citrus fruit, peach, honey, vanilla. Burgundy, Champagne, Juram Loire Valley.